In1964 Robert Kearns invented the intermittent windshield wiper. But it would be 26 years and take more than a decade of litigation before he reaped the rewards of his invention. Payday for Kearns finally arrived in 1990 when Ford Motor paid him more than $10 million to settle the patent infringement lawsuit he brought against the company. Recalling Kearns’s story, which was turned into the 2008 feature film Flash of Genius, seems an appropriate lead-in for today’s blog on how to make money from your patent. Before I get to that though, let me briefly touch on the subject of patents and patent law in general. The first thing you need to know is that there are good patents and bad patents. A good patent is a strong, enforceable patent that maximizes your protection and profit. A bad patent, on the other hand, while it may keep a few competitors out of your market, will not hold up when you try to enforce it. In this case you could lose your patent or have the court redefine it as much more limited in scope. Plus, you may be liable for any costs associated with your lawsuit. You need to have a novel invention – no great revelation there. You need to have a good patent law attorney – again, no great revelation. There is also a third factor; albeit one that is out of your control. To increase your odds of getting a good patent it helps to have a good patent examiner. A good patent examiner will do a thorough review of your patent application and make solid legal arguments as to why you can or cannot have the scope you seek for your patent. He or she will look at many patents similar to yours; and those patents will all appear on the cover of your patent. As a result, any judge reviewing your patent information, seeing that the examiner clearly did a thorough investigation, will be less inclined to give merit to competing claims. In the unfortunate event you draw a less than stellar patent examiner, you have the option of appealing the examiner’s decisions to the Patent Trial and Appeal Board (PTAB). The PTAB is a group of judges very knowledgeable about patent law. While appealing an examiner’s decision to the PTAB is slower and more costly than prosecuting your patent application with an examiner, it at least guarantees your arguments will obtain a fair hearing, by an impartial group of patent-savvy judges. Can I sell it? – This was the original intent of Mr. Kearns with his intermittent windshield wiper. But Kearns was a skilled engineer, not a salesman, not a marketer and not – for that matter – a businessman or entrepreneur. This is in line with my experience with inventors over the years. Namely that, as a rule, inventors do not make good sales and marketing people. And without effective marketing and a winning sales effort, your great new product is dead in the water. (Truth be told, people will rarely beat a path to your door, no matter how much better your new “mousetrap” is.) That is why great salespeople with so-so inventions are so often more successful than great inventors with so-so sales skills. All this is not to say that selling your invention yourself is out of the question. If you have adequate funding, you can recruit and hire a management team and ramp up your production, marketing and sales. But most inventors typically do not have ready access to the substantial capital it takes to pull this off. Fortunately, today it is a lot easier to raise enough funds to at least get things off the ground. For example, you can use a site like kickstarter.com to create a buzz, crowdsource funds and generate initial sales. In general though, for most inventors, selling the product themselves is not the most viable option. Can I license it? – When you license your product you will give up a lot of control and substantial revenue. Still, patent law is such that the licensing model can work out great for the patent owner and the licensee(s). But know this: Nailing down a licensing agreement with a major company can be a difficult task. You cannot just walk through the doors at a Hasbro, a Mattel or a similar brand-name company, show or demo your great new product and expect to get a licensing deal. In many cases, with many big companies, you will be up against a deeply ingrained “not-invented-here” bias. Simply put, companies will be reluctant to cut a deal with you, often out of fear that doing so will reflect unfavorably on their own intellectual and technological prowess. In other instances, a company may perceive your offering as a threat to an existing product or one they have in development. Assume you buck the odds. You get a meeting with a big, brand-name company and the meeting is a success. Company executives love your product or technology. So much so that they offer you a huge royalty fee in exchange for an exclusive licensing agreement. With visions of a steady stream of large checks pouring into your bank account you shake hands with your new business partners and tell them to draw up the papers. Time to pop the cork on a bottle of the bubbly stuff, right? Maybe not just yet. Hold off until you review the contract. When you receive your contract there are three key words you and your patent law attorney want to look for. Those three words are guaranteed minimum royalty. Inclusion of this phrasing in your contract is a clear indication that the company you are licensing is serious about marketing and selling your product. Without such language, especially in an exclusive licensing agreement, I strongly advise that you reject the contract. Because if your licensee is not willing to pay you a guaranteed minimum royalty it is most likely—for competitive reasons—trying to take your product off the market. And that is exactly what your exclusive licensing agreement, absent the guaranteed minimum royalty clause, will enable the company to do. The above scenario notwithstanding, licensing is, for many inventors, a very viable business model. Can I pursue infringers? – The emphasis here is on sue. In this instance, you do not make or license a product. You simply pursue legal damages against companies that are making products that make use of your patent, which is usually technology-related. It is a very controversial business model and these “non-practicing entities,” as they are known, are derisively referred to as patent trolls. In a nutshell, you get a patent and then hire a team of patent law attorneys to go after companies that are infringing on your patent. Your legal team negotiates settlements or gets judgments against infringers, taking a hefty share of any payoff its legal actions produce. The more settlements and judgments your lawyers effect, the more money you and your lawyers make. One big problem with the “pursue infringers” monetization strategy is that there is a lot of backlash against it and the law in this regard is in a state of flux with the pendulum currently swinging against “patent trolls.” So when the first business your team sues finds out that you are a non-practicing entity, it is likely to be resistant to a negotiated settlement. And should you go to trial and lose your case, you could also end up having your patent invalidated. The big benefit for the inventor is that this strategy requires very little capital. Depending on your patent – say for example yours covers a new software app that every cell phone manufacturer will eventually have to use–the upside could be huge. Like I wrote though, patent laws are in a state of flux, so if this strategy appeals to you stay attuned to what is happening in this area. Also, for the record, as a patent law attorney I do not typically represent non-practicing entities. In summary, you can make money from your invention/patent by selling it, licensing it or pursuing infringers. All three strategies have varying degrees of challenges, risks and rewards; and depending on your invention any of the three can pay off for you. It has been my intent today to pose these strategies and bring to your attention some key considerations and few of the major pitfalls to be aware of. Brett Trout, JD, is a registered patent attorney and nationally recognized speaker on patent, trademark, and internet legal issues, and also advises clients on complex technology agreements, including licensing and transfer. He received his undergraduate degree in chemistry from Grinnell College and his juris doctorate (with Distinction) from the University of Iowa, College of Law. Brett has been a contributor to several intellectual property and information technology books and has also authored three books of his own: Internet Laws Affecting Iowa Companies, Internet Laws Affecting Your Company, and the bestselling Cyberlaw. His blog, BlawgIT, was voted one of the ten best law blogs in the world, and he has been a featured national presenter at both BlogWorld Expo and the 140 Character Conference. 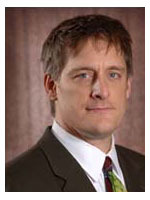 Brett is past president of the Iowa Intellectual Property Association and past Chair of the Iowa State Bar Association Technology Committee. He is also the co-founding director of the Iowa Volunteer Lawyers For the Arts project.